When I was pregnant with my second daughter, I really got into making busy bags. I put together a variety of activities that supported her early learning in the hopes they would keep her busy when the baby arrived. 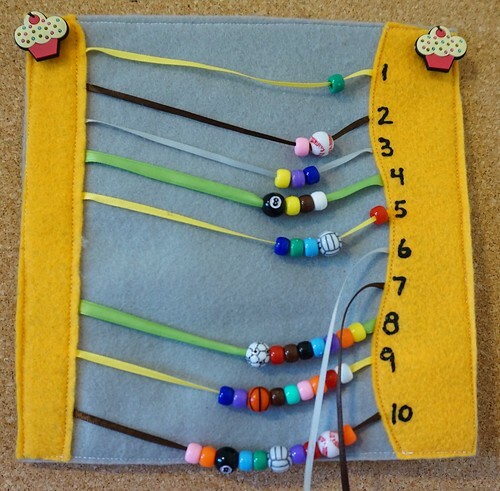 While doing busy bag research on Pinterest, which you can see on my Fun Kids Crafts & Activities board, I discovered quiet books. There is so much adorable quiet book inspiration on Pinterest, I quickly put together a Quiet Books board. Now that it’s been a couple of years, and I still haven’t made a quiet book yet, I think it’s time I get to it! We’re doing some traveling this year, so putting together activities for the girls is becoming a priority. I mean I don’t want them plugged into iPads the whole time! 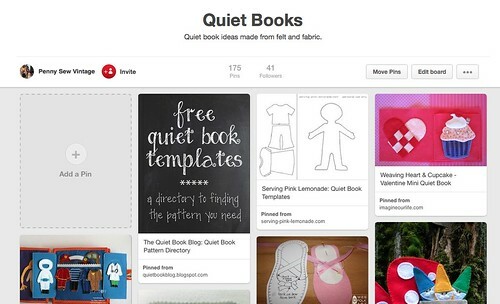 I began by separating my quiet book inspiration on Pinterest into Toddler Quiet Book and Pre-K Quiet Book. 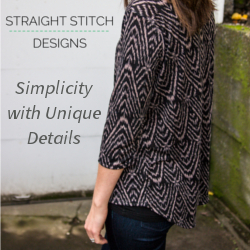 I’m using a lot of the inspiration and tutorials from blogs, as well as my own twist as I use up what I have on hand. I find that after I get started on a page, I end up running into something I didn’t anticipate. I will share each page as I finish them, including how I made them. I want to remember this for when I attempt to recreate them one day! I chose to go the felt route over quilting fabric. I only have 6 more weeks to finish 2 books, and felt doesn’t fray! I also decided to make them 8.5″ square because I have a ruler that size. Easy! My first completed page is a fun one! I started by finding a silhouette of a face that I like. You can find a couple of the ones I found on my Quiet Books Board. I cut out the silhouette on some felt using a color close to my daughter’s skin. Then I chose some pink yarn and cut long strands. 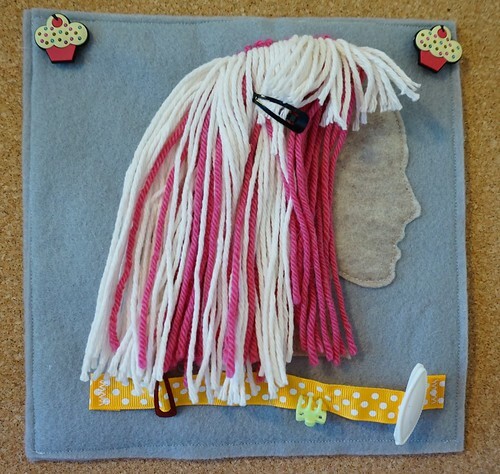 I placed the felt silhouette on the felt page, then placed the ends of the pink strands under the felt silhouette where I wanted the hair to be. I sewed all around the silhouette, securing the yarn. When I finished and flipped the yarn down, I sewed another line over the top of the yarn to keep it down. It looked a little bald, so I added some white yarn by cutting long strands, placing them over the pink hair, matching the center of the white strands over the line I just sewed over the pink yarn. The reason I placed the center of the yarn over the line I had just sewn is because I couldn’t figure out how to attach the yarn differently, and I really wanted some thick hair! I sewed over the middle of the white yarn strands to secure them, then flipped the yarn down. Its look much fuller now. I trimmed the white hair to match the length of the pink hair. I sewed ribbon at the bottom and added some barrettes to the ribbon. The barrettes pulled the ribbon down, so I stitched down the middle of the ribbon to hold it securely. 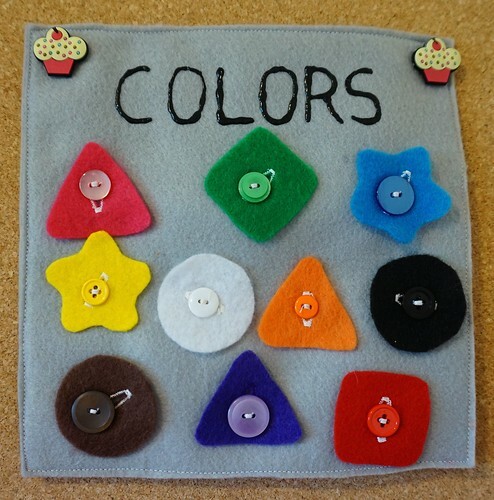 My second page is a shapes and colors page that focuses on my toddler’s fine motor skills. This one I actually made awhile back, but I’m going to include it in the book. This was mainly buttonholes and buttons using my sewing machine. I traced the shapes from a shape sorting toy we used to have. The shapes are a single layer of felt, but I’m thinking I should’ve doubled them up in thickness. I also used puffy paint for the “COLORS” title. The third page was a fail in a couple of ways. I was attempting to make a counting page, but the ribbons were just too loose and hung to much, and my daughter was able to pull a couple of them free. Choking hazard much? This page was just boring in the end anyway, so I’ll come up with something more fun and safer. There you go, my first attempts at a quiet book! I have more coming too 🙂 Please share any of your quiet book pages, or favorites you have. I love to hoard ideas!